Do others see us as we intend? An exploration of physical states and communicative messages. How does your stage presence impact on the well-being of the patient and affect the dramatic narrative of the consultation? Thursday 21st February. Performing medicine. Evidence suggests that tone of voice has a significant impact on communication with patients. In this session a voice coach from a leading theatre company will show you how you can have more control over the affect your voice is having in a consultation. Thursday 20th March. Performing medicine. Working as a team is one of the most challenging aspects of working on a busy ward. This fun workshop introduces a range of games and exercises to help you work more effectively, flexibly and peacefully with other people. Bookings accepted from 6th March. More information. • For students to convey information appropriately with an understanding of each others professional language. • For student nurses to develop an understanding of the effects of hearing loss on speech perception in older people. 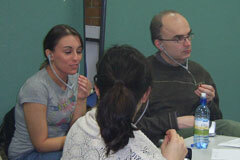 • For student nurses to develop knowledge and skills in hearing aid function, use and basic maintenance. Theatre workshop that addresses power and status transactions and examines the idea of status using a number improvisational games and archetypal masks with John Wright. 15th May. Performing medicine. Bookings accepted from 1st May. Suitable for: Any professionals that work with individuals who have sustained a brain injury including speech and language therapists, occupational therapists, physiotherapists, neuropsychologists, nurses, doctors, etc. In this workshop Professor Ylvisaker will address a set of closely inter-related issues that tend to be critical in the rehabilitation of individuals with traumatic brain injury. Substantial changes in ability profiles after the injury often block a return to the social, vocational, and educational pursuits that defined meaning in life before the injury. In addition, damage to the frontal lobes typically impairs self-regulatory capacity as well as the ability to reflect in an organized manner about ones new identity. Thus rehabilitation professionals become, in part, consultants to the person’s difficult process of constructing meaning in life, reconstructing a satisfying and organized sense of personal identity, and learning how to regulate emotions and behaviour so that meaning and identity can be effectively constructed. Professor Ylvisaker will present procedural details in these domains as well as illustrative case material. After an early career teaching philosophy at Carleton College and the University of Pittsburgh, Dr. Ylvisaker became a speech-language pathologist. Currently, he is Professor of Communication Sciences and Disorders at the College of Saint Rose in Albany, New York. He has over 30 years of clinical and program development experience with children and young adults with neurogenic cognitive, self-regulatory, behavioral, and communication disorders in rehabilitation and special education settings. Dr. Ylvisaker is author of over 125 publications, including six books and a large number of journal articles and book chapters. His two most recent books are (1) Traumatic Brain Injury Rehabilitation: Children and Adolescents and(2) Collaborative Brain Injury Intervention: Positive Everyday Routines, with Tim Feeney. He is actively engaged in the work of several professional organizations, serves on a number of national and international committees and on the editorial board of six journals, consults to rehabilitation and education programs in 13 countries on five continents, and presents frequently to national and international audiences on topics related to rehabilitation and education of individuals with cognitive, behavioral, and communication disability. Places are limited. To register please download the registration form (download registration form here), complete it, print it out and mail to CETL. Please include your registration fee. In this last workshop, theatre practitioner Sylvan Baker will unravel some of the issues that are important to the group. Through games and exercises influenced by the work of famous Brazilian Theatre director Augusto Boal, Sylvan will help you to explore the areas of your work that are most challenging and find out what are the obstacles preventing you from becoming an excellent, fulfilled and inspiring health professional? 1) Please e-mail c.buckwell@qmul.ac.uk and insert the code (PM08/06) in the subject line of the e-mail. These facilitated drop in sessions will help you to identify and work on any gaps in your knowledge and skills. You are invited to get involved in a realistic patient scenario before recieving feedback from a facilitator. This optional session will give you th eopportunity to combine clinical and communication skills, work as part of a teamand reflect on your practice as a whole. Please apply by sending an email to c.buckwell@qmul.ac.uk stating your name, profession, year and a few sentences about why you would like to come. Need to hone your clinical skills? Cover skills such as blood pressure, ABG sampling, phlebotomy, cannulation, CPR, oxygen therapy, male catheterisation, injection technique, and more. These sessions take place every second Wednesday of the month. OSCE Retakes? Need help with clinical skills? Confidence crisis? 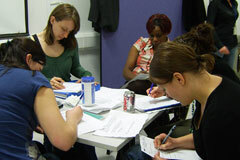 Are you a healthcare professional employed by City University, Queen Mary University or Barts and the London?